Fine Art Maya’s own Artists, Uwe Arendt, Talieh Kesh, and Manss Aval will be at Spectrum Indian Wells, held in California’s Coachella Valley on March 17–20, 2016. This is the first year for the Spectrum Art Show to be in Coachella Valley and it is truly an exquisite location for the highly acclaimed show. A wide array of media will be displayed at Spectrum Indian Wells, including paintings, photography, sculpture, glassworks, and more. We do not accept jewelry, tapestries, or any sort of arts and craft works. Spectrum Indian Wells is a juried show with an Exhibitor Committee consisting of four individuals with outstanding reputations in publishing and artist development. Strict hanging guidelines, aesthetics, and attention to detail will be enforced, providing a streamlined, crisp, and clean venue for gallery owners, designers, architects, and collectors to enjoy. Venue — Taking place at the Renaissance Indian Wells Resort & Spa in the heart of the Coachella Valley, SPECTRUM Indian Wells will welcome its esteemed exhibitors and attendees to luxurious gallery-style settings against a stunning desert landscape. Indian Wells is home to innumerable country clubs, tennis clubs, upscale resorts, chic eateries and bars, and, of course, killer sunsets. It’s the perfect backdrop for a weekend of outstanding aesthetics and art. The event will feature highly talented Artists and their selected artwork displayed in new, state-of-the-art, gallery-style exhibits. This year, the hosts of the Spectrum Indian Wells Art Expo have spared no expense in creating a truly stunning event. Wells Resort for a spectacular weekend. A percentage of ticket sales go to benefit Desert AIDS Project, a community HIV-specialty care, advocacy and services organization. 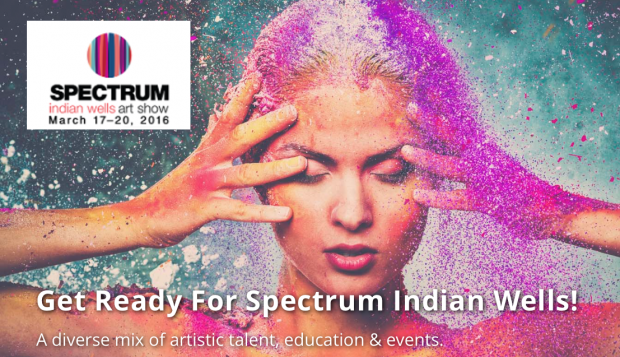 Get your tickets to the Spectrum Indian Wells Art Show here.Visit Spectrum Indian Wells Art Show website for more details here. Hope to see you there! Images & Screenshots: Spectrum Indian Wells.